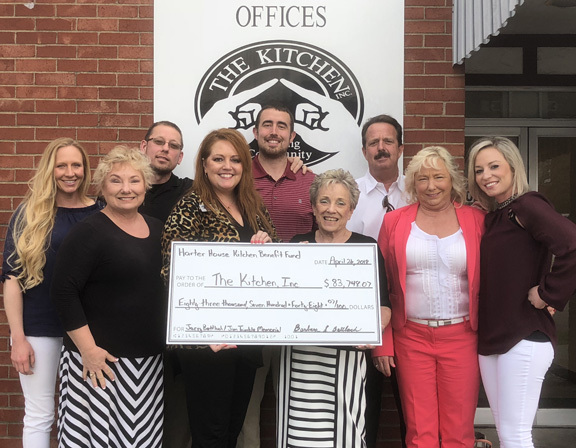 Harter House Raises $83,700 to Benefit The Kitchen, Inc. – The Kitchen, Inc.
NewsHome News News Releases Harter House Raises $83,700 to Benefit The Kitchen, Inc.
SPRINGFIELD, Mo. (April 27, 2018)— Harter House stores in Springfield, Hollister, Nixa, Kimberling City, Strafford, and Shell Knob raised $83,748.07 to benefit The Kitchen, Inc. during the 21st annual Jerry Bettlach / Jim Trimble Memorial event. The event continues to be the largest fundraiser of the year for The Kitchen and took place from February 28 – March 6, 2018. The Kitchen, Inc. provides housing and support services to those in need in Springfield and the surrounding communities. To date, Harter House has raised more than $1,000,000 for The Kitchen, Inc. Even before Harter House Butcher Shop in 1973, the Bettlach family had been perfecting meat cutting techniques and family recipes in St. Louis, Missouri since the late 1800’s. In 1973, Jerry and Barbara opened their Harter House Meat Market. Since then the business has expanded to seven locations. Since 1973, our goal has been to provide customers with the best shopping experience they can have. Our long-term employees are our greatest assets and they work hard to foster Harter House’s relationships with all of our customers. The Kitchen, Inc. fosters stability and purpose in the lives of individuals and families through dignity, compassion and accountability. Within our diverse community of connected services, we offer resources to meet immediate needs and a plan that actively engages progress toward a positive future. Our clients experience the benefits of their own efforts. And the stories of self-sufficiency and success are theirs and theirs alone. SPRINGFIELD, Mo. (February 16, 2017) – The Kitchen, Inc.’s Commercial Street campus has a new owner. The sale of the property is another step in the development of the much needed new campus located at the corner of Glenstone and Chestnut Expressway.